The last time that the Nonprofit Quarterly checked in with Occupy offshoot Strike Debt and their Rolling Jubilee Fund was in November of 2013, when their total amount of purchased consumer debt—mostly medical—had reached 14.7 million dollars. This week, on the anniversary of the Occupy Wall Street protests, the nonprofit announced that they had acquired and zeroed out an additional $4 million in student loan debt. 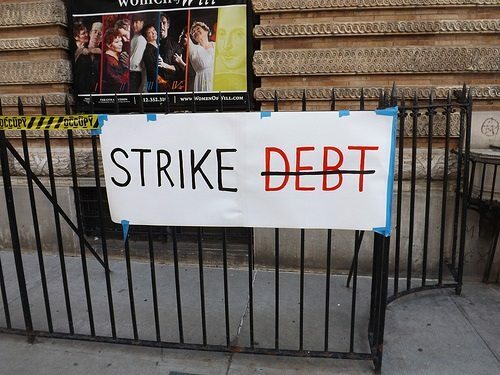 The long-term goal of Strike Debt is to organize “debt collectives,” wherein people with defaulted loans or other unsolvable debts can negotiate for better terms with creditors and otherwise escape unsavory debt collection practices. To this end, they’ve organized a kind of FAQ for students at Corinthian College schools like Everest, WyoTech, and Heald, informing them of the details behind their situation and offering advice for future action.